I don’t think you can create a truly great garden without growing Bearded Iris. Superb hardiness, essential foliage, and, in my mind, one of the prettiest bloom forms of any perennial make Bearded Iris a must for the northern garden. What’s that you say? You’ve heard that Bearded Irises are hard to grow? Nonsense. Bearded Irises love growing in northern climates; all it takes to grow most cultivars successfully is a smidgen of what’s known as gardening. Speaking of cultivars, there are far too many to mention here. There are more than twenty thousand named varieties. That’s right. A two followed by four zeroes. And you thought some nursery geeks go a little overboard when it comes to daylilies. What other plant gives you this great, broad, slash of leaf? 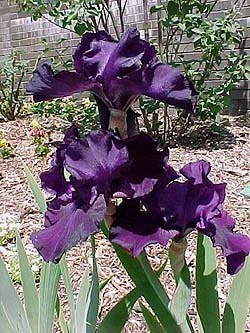 Start planting Bearded Irises for the form of their foliage. It contrasts with nearly everything in the garden. Your nearest nursery will stock at least ten varieties, perhaps thirty, and Bearded Iris are very popular in the mail order nursery business. Some nurseries specialize in the plant, and sell nothing else. You should be able to purchase any size and color Iris you have your heart set on. Bearded Irises bloom in just about every color (and color combination) on earth. Border Bearded (BB) – 15 to 27 inches; flowers 4 to 5 inches across; late bloom. Intermediate Bearded (IB) – 15 to 27 inches; flowers 4 to 5 inches across; mid season bloom. Miniature Dwarf Bearded (MDB) – 4 to 8 inches, flowers 2 to 3 inches across; early bloom. Miniature Tall Bearded (MTB) – 15 to 25 inches; flowers not more than 6 inches combined height and width; 6 to 12 blooms per stem. 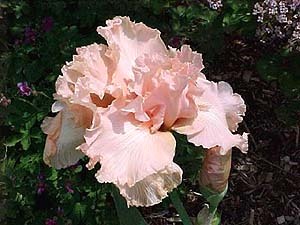 Commonly used in cut arrangements (“table irises”); late bloom. Standard Dwarf Bearded (SDB) – 8 to 15 inches; flowers 3+ inches; early bloom. Tall Bearded (TB) – 27 inches and taller; flowers 6 to 7 inches; late bloom. Arilbred (AB) – patterned blooms with white collar (aril) around each seed. There. Now you know what happens when the bar stays open late for members of the American Iris Society. Still, the classifications serve to steer you toward the height of Bearded Iris, and time of bloom in the season, that will best serve your garden. TB are the largest, most common, and popular; SDB is a popular class with good disease resistance; IB is an important group as they are the only offering mid season bloom; MDB is fun for rock gardens, and expand quickly; AB is the most obscure and the only group that are somewhat difficult to grow. Bearded Iris like sandy soil that drains well. This is the only reason I can think of that has led some to say that they are difficult to grow. Planting Bearded Iris? Dig up the soil in the area to a depth of twelve inches, shovel it into the wheelbarrow. Add some coarse sand to comprise 10-20% of the soil mix. Toss in a little organic material if the soil hasn’t had any in a while. Dump it back in, tamp it slightly, plant. Bearded Irises love full sun, and need at least five hours of direct sunlight to stay healthy and bloom at their fullest. I do have a few that receive just under four hours of direct, midday sun, and they bloom OK, and grow larger each year, but that’s the minimum. Bearded Irises grow from rhizomes, thick, fleshy stems from which the roots protrude. The only trick to growing Bearded Irises (after you’ve amended the soil as above) is that you not plant them too deeply. The top third of the rhizome should be visible after planting. Bearded Irises like average moisture (1″ per week) until bloom. After bloom, reduce amount of watering. They go into a semi-dormancy, and you don’t want to water them much more than a little every two weeks or so. Later in the season you’ll note they have returned to vigor and begun producing new rhizomes. Resume normal watering. Best bloom is produced by fertilizing with 5-10-10 fertilizer early in the season, next few weeks would be fine, then again as you notice the flower buds emerging from the leaves. Planted too deeply. Can you see the top of the rhizome? They need division. Divide Bearded Irises every three to five years. Dig them up, and snap the rhizomes apart until you have one rhizome with one set, or fan, of leaves. Divide Bearded irises in late August. Trim the roots a third of their length, and cut the fan to 4 inches with sharp shears or scissors. Replant, and water in well. Bearded Iris are, truth be told, susceptible to iris borer, and they can make things ugly. For preventative measures, and treatment if you have been invaded, refer to my article, Iris Borer Alert!